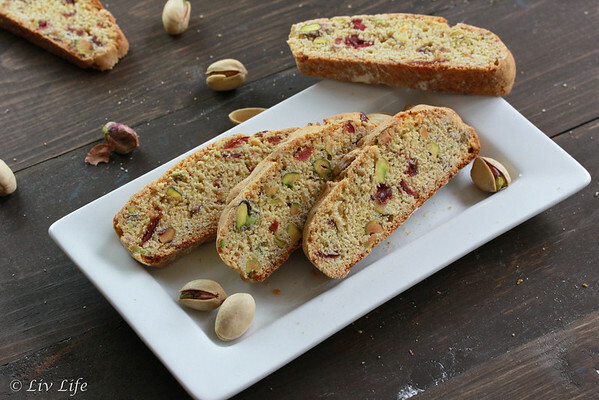 Perfect any time of year, but particularly festive with their green pistachios contrasting with the ruby cranberries, these rustic, whole wheat biscotti make a nice treat with your morning coffee. Or afternoon iced tea... or before bed glass of milk, etc. etc. etc. Preheat oven to 350º. Line a baking sheet with a silicone mat or parchment paper, or alternatively spray with cooking spray. In a large bowl, mix together the flours, baking powder, orange zest and salt. Whisk to combine and set aside. In the bowl of a stand mixer, add the three eggs along with the sugar. Blend until well incorporated, about 1 minute. Add the vanilla extract and mix for a few more seconds. Add the flour mixture to the bowl along with the pistachios and cranberries and mix just until incorporated. Pour the dough onto a work surface, and knead a time or two to fully combine. 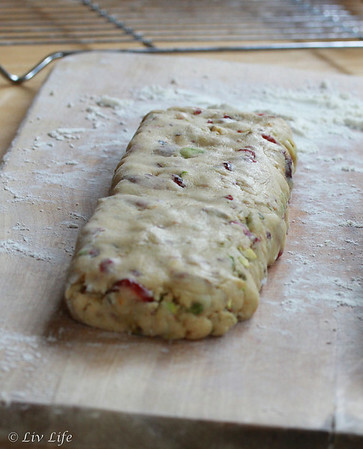 Divide dough into 2 equal portions and form into two 10-12 inch logs on the prepared baking sheets. Bake for 25 minutes or until lightly browned, rotating baking sheet once after 15 minutes to insure even baking. 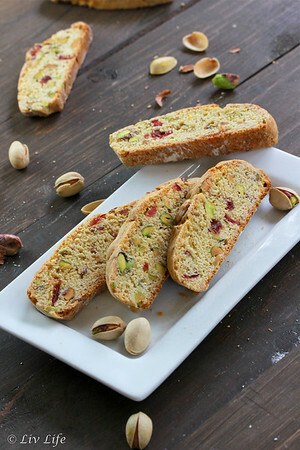 Remove the biscotti from the oven and allow to cool for 10 minutes. Using a serrated knife, cut the logs into 1/2-inch (or slightly thinner if desired) slices. Transfer the cookies back to the prepared baking sheet and stand them up... Basically cutting the log into slices, then just spreading out the slices, but not laying them down on their side. 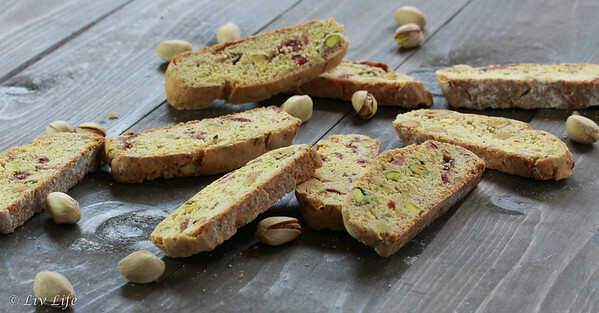 Reduce the oven temperature to 300º and bake the biscotti for another 15 to 20 minutes. Remove the pan from the oven and transfer biscotti to a wire rack for cooling. Note that the cookies will crisp as they cool. Store in an airtight container for up to a week... though I can't vouch for the freshness at that point as ours never lasted more than a few days... Enjoy! Now they are some good looking biscotti. I would love some of these to enjoy with my coffee, and like you I do allow myself a few extra treats at this time of the year. I do love knowing that by baking with Hodgson Mill those little extra treats would be healthier for me. I'm pouring myself a cup of coffee right now. Care to join me? 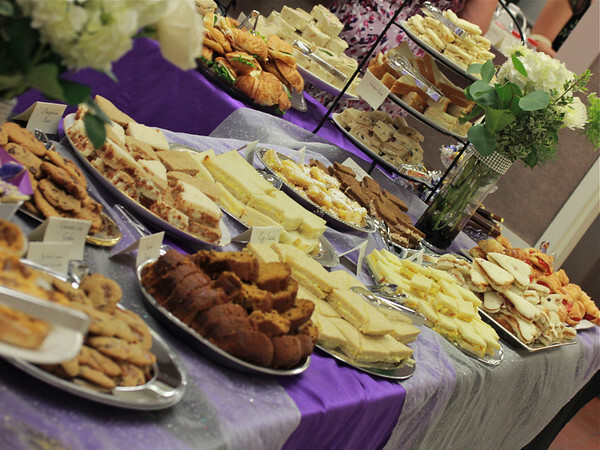 (Of course, do you mind bringing the biscotti?) :) I would consider it a high compliment too. For some reason, grandfathers' opinions carry so much more weight, don't they. Oh how lovely. 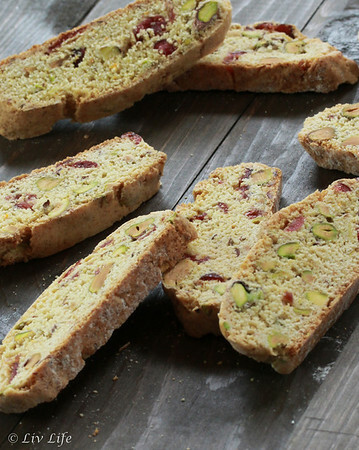 One of these biscotti with a cup of coffee would be perfection! Thank you for sharing! It all goes so well together... this has become a favorite! Just perfect! Looks like Christmas, just fantastic colors! This would make a wonderful hostess gift! I pinned this. Thank you so much, this is my first visit to your blog, and I will be back. It is nice to "meet you! Love this festive and healthy cookie for the holidays Kim!